While our natural teeth can last a lifetime, sometimes disease or trauma can lead to tooth loss. Losing your teeth can damage more than just your smile; it can also harm your ability to chew and eat, while placing other teeth at risk. A variety of procedures can replace missing teeth, but dental implant reconstruction is the modern standard procedure and are often the best treatment option to restore both your teeth’s function and your smile. As their name suggests, dental implants are long-term replacement teeth that are surgically inserted and secured into a patient’s missing tooth location. The bone then fuses around the implant stem, rendering the implant permanent. As a result, dental implants are much more like your original teeth than dentures or bridges. More comfortable than traditional dentures. Significantly higher function and minimized bone loss. More convenient than other tooth-replacement options. Are durable, lasting 20 years or more. Replaces missing teeth without damaging healthy adjacent teeth. As their name suggests, fixed implant restorations consist of a permanently secured tooth-colored crown and abutment. Where multiple teeth are restored through fixed implants, each crown is connected to its own attachment device. 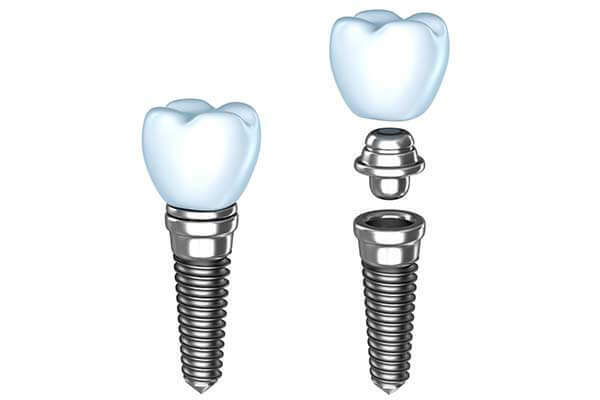 Fixed implants are a strong choice when a single tooth or a few teeth must be replaced. With this option, four anchors hold a full set of teeth. Because only four anchors are used, the remaining teeth are attached to a gum-colored arch, similar to dentures. However, this arch snaps securely onto the four anchors, so you don’t experience the same discomfort or slippage of conventional dentures. 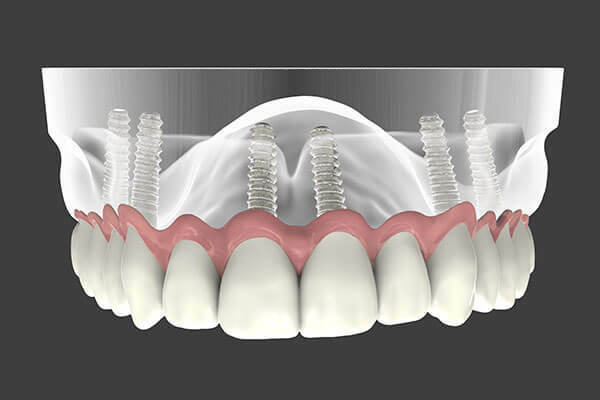 All-on-Four implants are an efficient, effective implant option to replace a large number of missing teeth. As you can imagine, dental implant procedures vary depending on the type of implant you need and whether additional procedures such as bone-grafting are involved. Implants are typically placed in one appointment while you are comfortably sedated. Following the placement surgery there are several appointments where Dr. Nagy monitors your healing. When healing is complete, typically three to six months later, we restore the implant and replace the missing tooth. Depending on your condition, a treatment crown may be placed at time of implant to replace the tooth immediately while healing occurs. Implant restored teeth are maintained the same way as natural teeth, which means that regular dental visits and home care as important to the health of your new implants as they are to your natural teeth. Periodontal disease, or gum disease, is related systematically to several other diseases or conditions. At Nagy Family Dental Group, we tailor a periodontal treatment plan to help minimize or prevent further damage to your gums. At Nagy Family Dental Group, we’re experienced in an array of dental implant procedures and can advise you on the best implant choice to restore your smile. Please call us today.